For the past 20 years or so, there’s been a very unusual ritual in Maryland to welcome the spring. Given that a groundhog plays a significant part in the average American’s perception of spring, and we routinely hang out with giant monster bunnies with evil faces, the fact that this event can be safely described as weird should tell you that it is pretty weird. It’s the yearly spring sock-burning! What started in the 80’s in the Annapolis Yacht Yard has since grown and moved locations. 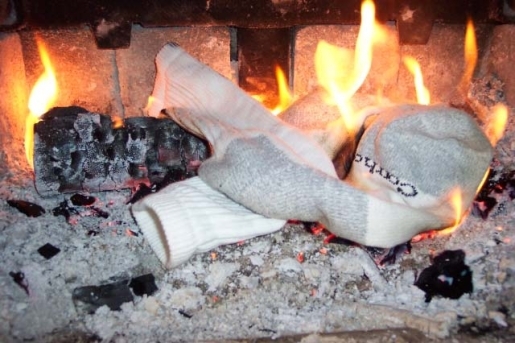 To celebrate spring and bid a last fiery adieu to winter boat maintenance, the Annapolis Yacht Yard manager Bob Turner had the first sock burning ceremony. Since then the event has become an event in tiny Eastport, Maryland, where the Annapolis Maritime Museum has taken up the event. Hundreds gather to party, drink wine, eat oysters, and, oh yeah, burn things. Any excuse is a good one, I guess!